PC Music label head A. G. Cook boldly kicked off his half hour-set with what had to be a new song, and yet it connected perfectly. Cook makes the most maximalist music of the PC family, using the same twinkling synth bells that Hudson Mohawke, SOPHIE and Rustie use to juxtapose their huge choruses, but eschewing their trap choruses for a something a little subtler. 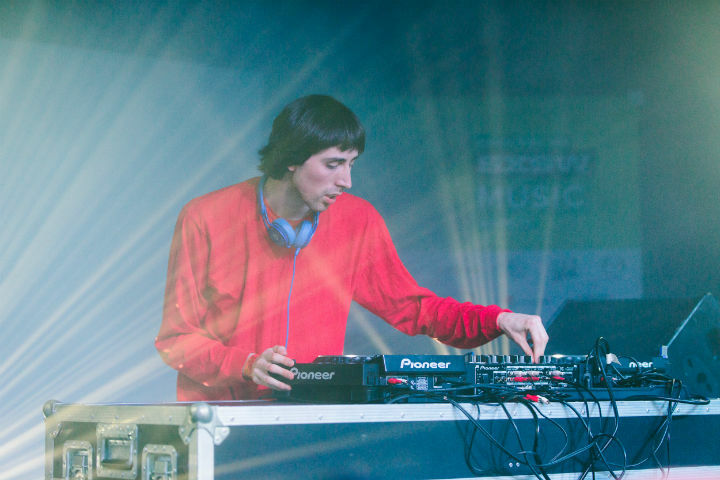 On this night, however, Cook stretched his beloved "Beautiful" into an epic, building tension in the song's intro and first few verses before bringing the chorus in with even more emphasis than usual; the audience clapped along and bounced higher than they had even for Danny L Harle's emphatic set earlier. Then he pulled maybe the most surprising move of the night, walking over to a keyboard on piano setting to sing — yes, sing — into a mic. "Do you believe?" he crooned to the audience as he built another banger from scratch. It all seemed jarring coming from a slight kid in a red jumper and sporting a bowl cut, but Cook co-founded PC; he helped shape the aesthetic, and he's written some of the label's most notable songs. He ended the set with his remix of How to Dress Well's "Repeat Pleasure," and then left when it was over, leaving the audience wanting "Keri Baby," which featured Hannah Diamond and was likely to be picked up in her following set.